Untitled (bone chair) by Eugene Von Bruenchenhein, c. 1965–1970. All works courtesy John Michael Kohler Arts Center Collection; photograph by Rich Maciejewski. Last month saw the opening of Mythologies: Eugene Von Bruenchenhein at the John Michael Kohler Arts Center in Sheboygan, Wisconsin, part of The Road Less Traveled exhibition series marking the fiftieth anniversary of the center’s founding. The show is one of fifteen—based around a group of artists that includes Mary Nohl, David Butler, Stella Waitzkin, Emery Blagdon, Loy Bowlin, Dr. Charles Smith, and Jesse Howard—that serves to recapitulate the mission of this off-the-beaten-path arts center: to bring attention to artists who for one reason or another haven’t—or hadn’t—made it into the mainstream. 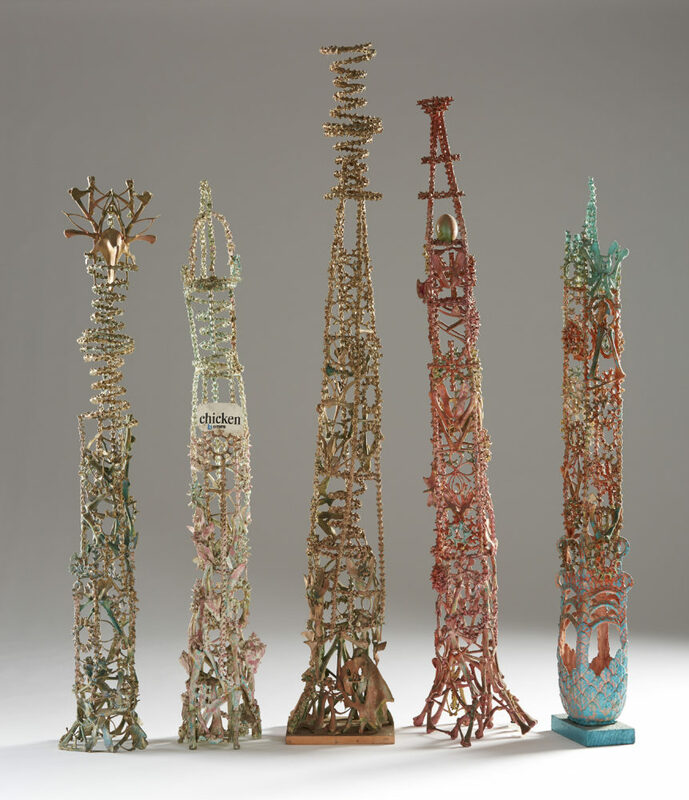 Untitled (bone towers) by Von Bruenchenhein, c. 1970–1980. Eugene Von Bruenchenhein was one of the hadn’ts. Now, having been the subject of a retrospective at the American Folk Art Museum in New York and having appeared in a slew of shows in major US and European cities over the last five years, Von Bruenchenhein is, by any estimation, experiencing something of a career moment. Or he would have been if he’d lived long enough to see it. He died in 1983, three years before the return of Halley’s Comet, which had showered the inner solar system with stardust the year he was born, 1910. The comet was key to Von Bruenchenhein’s sense of self. Along with the Von in his name (which he believed linked him to Old World nobility), it forged the conviction that he was destined for deeds of cosmic proportions. For the better part of his life—the part that wasn’t spent eking out an existence as a florist and baker—the high school dropout with big dreams fabricated the appurtenances of a fantastical kingship in the small Milwaukee house he shared with his wife, Marie. “Freelance Artist—Poet and Sculptor—Inovator [sic]— Arrow maker and Plant man—Bone artifacts constructor—Photographer and Architect—Philosopher,” he inscribed on a plaque that hung in his kitchen. By the time he died, his output tallied thousands of artworks, including chicken- and turkey-bone towers and thrones; incense burners made out of ceramic leaves; garishly colored nuclear-holocaust scenes painted using combs, fingers, and brushes made from his wife’s hair; and a trove of charming conjugal erotica—a concentrated universe of art. No 701 by Von Bruenchenhein, 1958. Von Bruenchenhein had tried without success to get gallery representation, and after his death a police officer friend shopped his work to the Milwaukee Art Museum. When nobody there wanted it, it fell to the Kohler Arts Center, which mounted his first museum exhibition in 1984 and holds the largest collection of Von Bruenchenheins in the world, as well as his archive of writings. Untitled (sensor [sic] pot) incense burner by Von Bruenchenhein, c. 1960–1980. Since at least the late 1940s—when Jean Dubuffet founded the Compagnie de l’Art Brut to promulgate the “raw” art he thought was vital—there’s been debate about what to call artists like Von Bruenchenhein and the others on view in The Road Less Traveled. Are they outsiders? Naive? Self-taught? Visionary? The Kohler Arts Center dances around the issue, demonstrating that, really, the question what do we call them? is premature. “In recent decades more people—artists, curators, cultural workers, whatever—have been expanding the boundaries of art and acknowledging contributions from many cultures and many communities,” says Karen Patterson, Kohler Arts Center curator. “As we broaden [our conception of what art is] there’s more room for all types of ideas and artists and art-making and artmaking trends.” For now, the mission ought to be one of exploration, not typology. After all, endeavoring to fit artists like Von Bruenchenhein into any category has to be about as quixotic as endeavors come. Production Friday July 28-1978 Liberty Complex in the clouds The Age of colored stone and steel by Von Bruenchenhein, 1978.